Building a small yet powerful PC has never been easier, thanks to the increasing popularity of feature-packed mini-ITX motherboards. 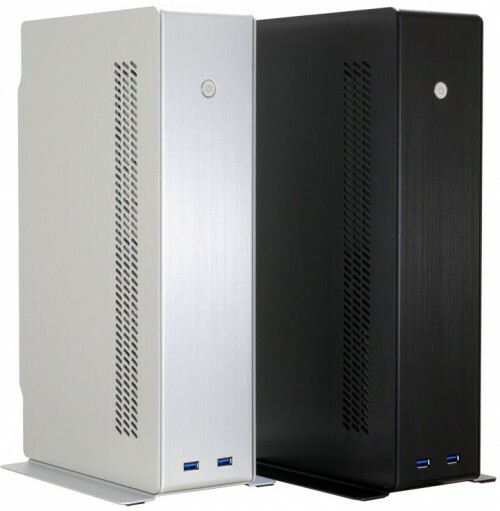 They’ve never been more attractive, either, as Lian Li’s PC-Q12 mini-ITX proves. So, let’s dig in and see if the chassis’ features are as attractive as its aesthetics. Installation of hardware in the PC-Q12 wasn’t exactly a smooth experience but was far from difficult. Thankfully, the power supply lacks a ton of cables, so tucking the unwanted wires away wasn’t all that difficult. With the side panel off, getting the I/O shield in place was simple. After that, the motherboard went in without issue and the four, non-removable, standoffs lined up perfectly. Power was thankfully well placed on the motherboard we used for testing, and the 4-pin was long enough to reach across the board to its connector on the board. One thing missing that some other mini-ITX cases offer is the ability to use a PCIe device with the help of a riser card. With the orientation of the power supply and CPU cooler, a riser card would be an impossibility if Lian Li wanted to retain the thin width the Q12 enjoys in its final design. Testing the cooling capacity of the PC-Q12 was done in a similar fashion to other chassis reviews I have done over the years. However, in full disclosure, I was never too concerned with its ability to cool, insofar as it was able to keep the hardware at an acceptable level. For the Q12, I started a pair of instances of CPU Burn-in (one for each core). While an older app, it has always served me well when trying to stress a CPU to get a temperature reading under load. As always, the procedure is me running it for a set amount of time; in this case, 30 minutes. At the tail end of the run, I record the temperatures of the CPU using Real Temp. The two cores are then averaged; ambient temperatures around our bench were kept at 68ºC. The Q12 won’t win any awards for cooling, but even at its hottest, it was still kept well below the 69.1ºC temperature that Intel sets the G530’s Tcase at. Adequate airflow is key with any PC build, but in our case today, the Q12 lacks any form of intake fan, so keeping the Sandy Bridge Celeron below 55ºC is a win in my book. I have built with Lian Li’s chassis many times over the years and I have recommended its cases to friends and family alike. I like what the company does and appreciate its attempt to hit most markets. The company has budget friendly offerings that sit side-by-side with insanely extravagant, expensive boutique cases. I know that this is simply good business on Lian Li’s part, but for those of us in the market for an affordable case, it’s nice to see that all of its Lancool-branded cases are made at the highest level of quality. The PC-Q12 will be a welcome addition to anyone looking for a chassis to place their mini-ITX motherboard into. It’s gorgeous, easy to-use, and can fit most anywhere. Airflow is a bit lacking but proved to still be more than enough to keep the modest CPU it held at an adequate temperature. The premise of tiny computing has always appealed to me. While there was a time when I was all about large, full-ATX builds, I must admit that those days seem to be long behind me. I like working with smaller builds and given the surge in the mini-ITX format over the past 18 months or so, I would like to think that I’m not alone. Anyone on the market for a small PC to serve as an entertainment hub or a simple workstation would do themselves a solid by considering this chassis. Available online for around $130 US, it might be a little steep for many, considering what it is. But, as with most things, you pay for what you get and with this case, you get quality. Well, quality and a 300W power supply. Who says you can’t have it all have almost everything you would want in a small case? Few can say that thanks to Lian Li.